Is Extra-judicial Killing by Drone – Israeli/US Style – Just Plain Murder? 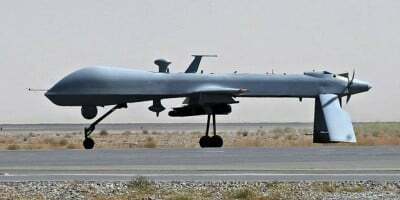 The methodology of sending an unmanned drone into enemy territory as in previous cases, the West Bank, Gaza, East Jerusalem, Iran, Syria, Iraq or Lebanon to kill those who are your political opponents – was pioneered by the IDF, Israel’s peculiarly misnamed attack force. It is the coward’s approach to liquidating one’s political opponents without any risk whatsoever to the operative who sits thousands of miles away, drinking a latte, as he decides whose life to summarily extinguish next and upon what ‘intelligence’ he can point to in claimed justification. The victim, of course, will already be dead, often together with his family, children and or work colleagues. They were not afforded to chance to defend themselves from the brave drone operator and his superiors. His body lies spread-eagled in the front seat of the car, his face blown away by the unseen missile as his blood seeps into the upholstery and onto the vehicle floor. His innocent passengers lie dead also on the front and back seats. The United States congress, on seeing how super-efficient the Israeli killing methodology is, soon copied it to great effect. And now, it must be admitted, the British government have been unable to resist the temptation also of killing at will, with no risk. It’s a sort of real life computer game in which you can zap anyone who displeases you or whom you merely do not like. But it’s not a computer game and hundreds of innocent lives have already been blown away at the flick of an Israeli, American and now British, switch. The future is indeed bleak. No more courts of justice: no more trials to determine innocence or guilt: no more evidence by the prosecution or defence rebuttal by the accused: no more lawyers or counsel: no more appeals: no more justice, in fact, just an Israeli or American liquidation operative pushing buttons on a killing console and committing murder between sips of coffee.